DESIGNER: J. FERRAR. OF THE SLEEVES OR THE PANT LEGS. MATERIAL: 100% WOOL. COLOR: NAVY BLUE WITH STRIPES. 70s Funky Hippie Mod to the 80s Emo Indie Biker. FLAT FRONT PANTS . CLASSIC TRADITIONAL. Pleated and cuffed pants, 34" waist, 32" inseam. Fully lined jacket. 3 button closure. This great looking J Ferrar 2 piece suit in a beautiful black. This suit is in great condition and appears to be lightly worn and well cared for. This suit is composed of 65% Polyester & 35% Rayon. Men's J. Ferrar Suit. Classic Fit. Brown color. Jacket size: 42R. Flat front pant size 34/29. Excellent condition. Black suit pre-ownede in good condition. The jacket is 42 L Slim fit. Pants waist 17", inseam 30", rise 11.5". WHERE AT THE OFFICE OR A NIGHT ON THE TOWN! Jacket is 42R. Pants are 34” waist with a 30” ineam. Two button jacket. Made of 82% polyester 18% rayon. Up For Sale is aJ Ferrar Custom Fit Suits Pants 34x32 With Matching Jacket Brown Or Dark Beige. We are only human and may make a mistake once in a while. Pant Waist (flat across front):34. Pant Inseam:29. Chest (underarm to underarm):21.5. Sleeve (shoulder seam to end of cuff):25.5. 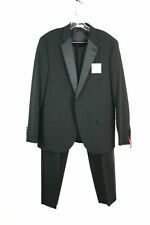 Mens 2 Piece Suit J Ferrar Suit 38 Long. Condition is Pre-owned. Shipped with USPS Priority Mail. JF Ferrar Navy Blue Mens Slim Fit Suit 46R, 34x34 Pants. Condition is Pre-owned. Shipped with USPS Priority Mail. (J Ferrar label on inside pocket of right side. Although jacket not fitted, fit perfectly on gentleman, who wore jacket over long sleeved 100% cotton shirt, also not included.). BLACK POLYESTER SUIT JACKET. Double vent. In very good used condition. Left pant hem is loose and needs to be sewn. - waist 34". - inseam 29". - Dry clean. - underarm to underarm 20". - sleeve length 25". J. Ferrar suit 34x30. Condition is Pre-owned. Suit is used but in excellent condition. Comes with jacket and pants. No size can be found on jacket, but appears to be a large. Shipped with USPS Priority Mail. The jacket features a 2 button closure and silky soft inner lining. The pants are pleated, uncuffed, and lined. The color is a rich golden beige that is perfect for any occasion. J. FERRAR SUIT. Color: Golden Beige. It looks great! It features a nice light beige color. It is made of 50% polyester and 50% rayon. It looks great! Pants Sizes. These Pants Have a Pleated Front. Color: Light Beige. Style: Solid Pattern (See Photos). Black Pinstripe 3-Piece Suit Size Small Vest. Black Suit 100% Wool. 34/30 Pants Cuffed/Pleated. This lot includes. However, there is slight pilling on the back of the pants. (see photos) It features a professional grey color with a textured pattern. This suit is made out of 65% polyester and 35% wool. Chest size: 46R. Great Suit by J Ferrar. Black with white and gray pinstripe.